Lt. Michael Burnham and the crew of the USS Discovery return for the "Star Trek: Discovery" Season 2 premiere, "Brother," on CBS All Access. It's here. Just 25 days shy of a year since we last saw the daring crew of the USS Discovery, they're back in the eagerly awaited Season 2 premiere, "Brother." The "Star Trek: Discovery" Season 2 premiere opens with a recap of the events of Season 1, followed by a monologue from Cmdr. Burnham (Sonequa Martin-Green) that's set to grainy footage from NASA's Cassini-Huygens mission. Straightaway, we're reminded of one of the single, biggest issues we had with Season 1: Why did Burnham have to be adopted by Sarek, when any high-ranking Vulcan could've worked? It unnecessarily complicates things and feels like something George Lucas would insist on. Why does everyone have to know everyone else? Young Spock evidently doesn't play well with other children, and it feels like this is attempting to sow the seed for the reason that Spock has never mentioned his adoptive sister, at any subsequent point. After all, he never mentioned his half-brother Sybok (Laurence Luckinbill) until 2287, when he attempted to hijack the USS Enterprise to fly to Sha Ka Ree in "Star Trek V: The Final Frontier." 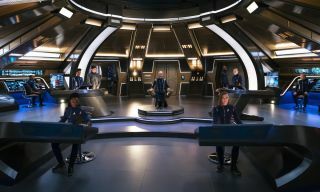 Sonequa Martin-Green as Burnham; James Frain as Sarek share a moment on the bridge of the USS Discovery in the Season 2 premiere of the CBS All Access series "Star Trek: Discovery." Cut back to the bridge of the USS Discovery almost at the very moment we last saw them in the Season 1 finale, "Will You Take My Hand?" Communication cannot be established with the Enterprise for some reason, and almost immediately, Ensign Tilly begins her fine-line performance between interesting and annoying. The bridge crewmembers gush over how gorgeous the Enterprise is (and she is), and Pike beams over to the Discovery. Both Sarek and Burnham expect Spock to be among the away team … but they will be disappointed. And the credits roll with much-improved artwork. Not exactly the most memorable of starts, then, for the Season 2 opener. On the way to greet Pike, Saru (Doug Jones) and Burnham talk a little about their respective siblings, and it's nice to hear Saru mention his sister, Siranna, which is the first reference to the "Short Treks" and in particular, the episode "The Brightest Star." We also see a Discovery crewman with what looks like an early version of a Geordi La Forge visor. Pike informs the Discovery crew that he's been instructed to take command. A fun throwaway remark is made to explain that the Enterprise crew "at least has the new uniforms," despite the fact that the Discovery crew all still continue to wear the old ones. Couldn't they just be replicated the way they were for the hundreds of Terran Empire uniforms in "Despite Yourself"(S01, E10)? The exposition starts right about here, and there's quite a lot in this first episode. Federation sensors have detected seven "red bursts" spread out over more than 30,000 light-years. They appeared and disappeared with precise synchronization; it's unknown what they represent, and no communication has been established. The Enterprise is apparently too badly damaged to go anywhere, so the best course of action is for Discovery to make its way to the only red burst still visible on sensors. The wreckage of a downed Federation starship (the USS Hiawatha) is also detected, so a plan is drawn up to try and reach it. Transporters can't be used, because of some complex, technobabble-based reason, and there's too much debris for a shuttlecraft, so lander pods will be used to get around. The pods — the smallest actual spacecraft we've yet seen — allow the writers to avoid the suggestion of atmosphere jumpsuits (like those in the recent films) into Discovery's storyline. Attempts are made to have fun with the script: some are successful and some less so. As Pike, Burnham, Lt. Connolly (Sean Connolly Affleck) and Cmdr. Nhan (Rachael Ancheril) prepare to use lander pods to reach the wreckage of the USS Hiawatha, Pike says to Nhan, "Go grab yourself a red shirt" — thus setting her up for a traditional "Star Trek" sacrificial death to prove how serious the situation is. But it's Connolly, wearing a blue shirt, who bites the big one as the lander pods make a perilous flight through the debris field. Actors Anson Mount (left) as Capt. Pike and Sonequa Martin-Green as Michael Burnham in "Star Trek: Discovery" on CBS All Access. In an environment straight out of "Armageddon," the three remaining members of the away team pick their way through the wreckage and find Cmdr. Denise Reno (Tig Notaro), an engineer from the Hiawatha who seems equally at home performing brain surgery on a Tellarite as she is building drones from salvaged ship components. In an attempt to keep as many of her shipmates alive as possible, she's created what, at first glance, looks like something out of a horror movie, with the biological organs wired up to life-support machines. We also see a different design for Discovery's environment suits, and while it could be argued that these are more flight suits, they have a disappointing, VFX-heavy retract mechanism that tucks the whole helmet away, very conveniently out of sight, in a way that's similar to a Jaffa warrior's helmet in "Stargate." Also, why does the turbolift shaft resemble Space Mountain, and how come the lander pods have so far to go to launch when they're so close to the end of the shuttle bay? These and other things need to be overlooked, but when they all add up, it does make an impact on the enjoyment of this first episode. Turns out the gravity of the asteroid is directly affecting dark matter, which cause a reaction in the spores aboard the Discovery, which reverses the polarity, resets the phase inducers and generates an inverted tachyon field – or something – and suddenly, we're overwhelmed with technobabble gobbledygook. The events of "Star Trek: Discovery" unfold from 2256, which is two years after the events of "The Cage." That show formed the very first pilot of "Star Trek: The Original Series" in 1966, and it was later reused for the two-part episode "The Menagerie" (S01, E11 and 12). "The Cage" is significant, because we see that Christopher Pike (played then by Jeffrey Hunter) is in command of the USS Enterprise. However, at the beginning of that episode, we also see that he is seriously contemplating quitting Starfleet and blames himself for the deaths of some crewmen in a prior, unseen incident on Rigel VII. "I'm tired of being responsible for 203 lives. I'm tired of deciding which mission is too risky and which isn't and who's going on the landing party and who doesn't. And who lives. And who dies," he says to Dr. Phillip Boyce (John Hoyt). Anson Mount's more cavalier Capt. Pike would suggest that these events haven't been factored into his character, but it is too early to tell for sure. He certainly comes across as relaxed and incorporates humor into his command. But occasionally, it feels uneven, and that he's trying just a bit too hard. To his credit, though, he does remember everyone's name. As Burnham is being beamed back aboard, she tries to grab a piece of the asteroid, as per Tilly's request for analysis, but the transporter can't lock onto it, which means only one thing – it's made of Kryptonite it's not entirely made up of compressed baryonic matter. Needless to say, Tilly gets very excited. An attempt is made to lock onto a larger piece of asteroid with a gravity beam, which proves successful, even if it does significantly damage most of the shuttlebay. Tig Notaro as Chief Engineer Reno on "Star Trek: Discovery" in the CBS All Access series. Pike settles in to his new, albeit temporary, command. While in Lorca's ready room, he finds a crumpled note from an old fortune cookie that reads, "Not every cage is a prison, nor every loss eternal," clearly a reference to events that have already transpired for Capt. Christopher Pike. Finally, the Discovery returns to where they left the Enterprise, which is now under repair and Burnham has a wander around Spock's (Ethan Peck) quarters. Here she finds a recorded message that indicates not only was he not sure he would survive when he went off to do his thing, but also that he had some understanding of what the "red bursts" are. This episode was directed by Alex Kurtzman, who has clearly been studying the Vince Gilligan "guide to creative camera angles." In fact, the edits and interesting POV shots in this episode are the best bit by far, from the trundling wheel of a med-bay gurney (wouldn't they have hover gurneys in the 23rd century? ); to the closing and opening of doors as a device to change scene; to framing Burnham in doorways, they are inventive and very effective. "Brother" does get better the more times you watch it, but after the very first viewing, you can't help' but feel shortchanged. Discovery is a product of 21st-century television, when we've had series like "Battlestar Galactica,” ”The Expanse," and “Black Mirror” and high-quality non-sci-fi like "The Sopranos" and "Breaking Bad." Consequently, the standard of storytelling can be higher offering a more cerebral experience. This episode of "Discovery" felt like everything was a bit everywhere. The second season of Star Trek: Discovery has 14 episodes with no midseason break. It airs on Thursdays at 9 p.m. EST on CBS All Access in the U.S. and Canada, and in the rest of the world on Netflix on Fridays.